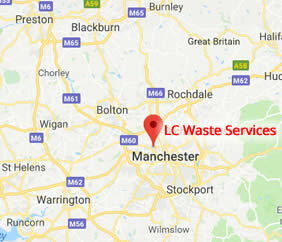 LC Waste Services are a professional skip hire company based in Manchester with an enviable reputation for quality, value, reliability and outstanding customer care. We have been in the industry for over 35 years and our staff are fully trained and highly skilled so you can be assured of a quality service. With skip sizes from 8 to 16 cubic yards, whether you're a commercial or domestic customer, we are certain to have the right size skip for you. Our skip hire prices are amongst the most competitive in Manchester and our service is fast and reliable so why not call LC Waste Services today! Call us on 0161 7369084 or request a skip hire quote online. With a wide range of domestic and commercial skips for hire including standard, lidded and lockable skips, we can arrange a service that meets your specific requirements, organising skip exchanges and collections upon request. For skip hire in the North West contact LC Waste Services today. Conveniently based in Manchester, we offer skip hire in Manchester, Salford, Bury, Wigan, Atherton, Leigh, Chorley, Preston, Oldham, Rochdale, Heywood, Stockport, across Lancashire, Cheshire and Greater Manchester. Call for more information on 0161 7369084 or request a Skip Hire Quote online.